Here we are…deep into the holiday season. With Christmas right around the corner, it’s time to think about your Christmas dinner menu. At my meat market we get so many special requests and have so many different meat items to choose from at this time of the year. Helping my customers decide on the meat, how much to purchase and how to grill it is truly the part of my job that I love the best. Yes, even on Christmas we are grilling!!! The beef tenderloin spans into two of the primal cuts of the steer. It starts just past the ribs and ends in the sirloin, just before the rear leg. The cut is oblong in shape and tapers at one end. 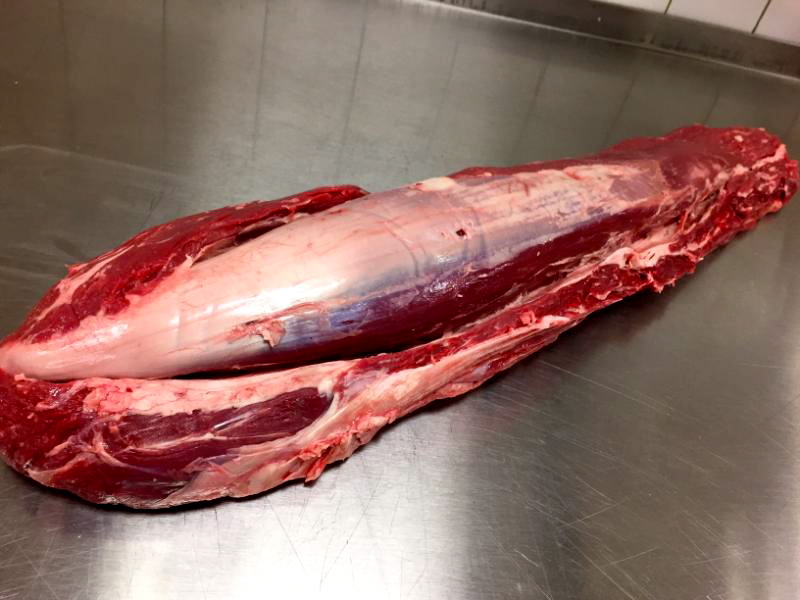 This muscle does very little work, and that’s why it’s so tender!! Beef tenderloin is a great choice for your Christmas dinner because it’s relatively easy to prepare. It also cooks quickly, has a nice presentation, and has no bones or fat to deal with. 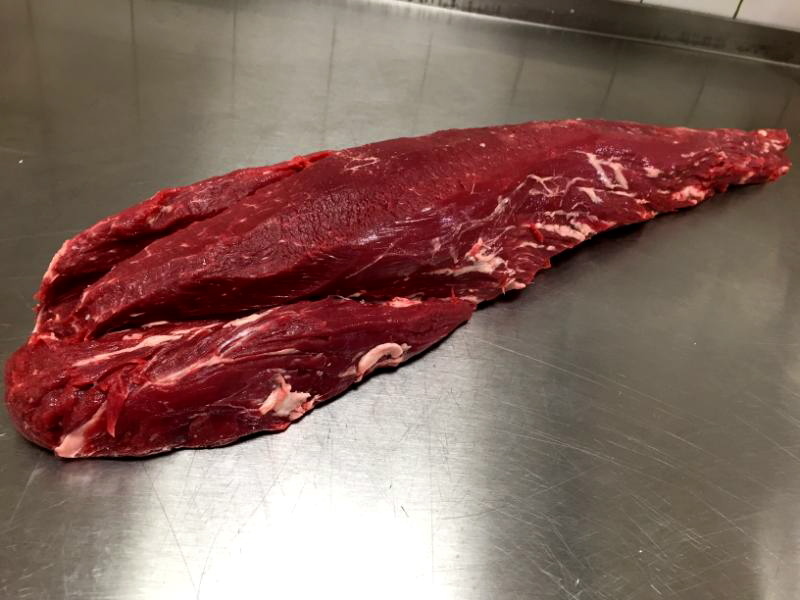 If you buy a beef tenderloin that is untrimmed, you’re going to have some work to do. You must remove all the “silver skin” and the “side chain” (which is the grizzly piece that runs the length of it about ½ inch in diameter). Fully trimmed tenderloin will weigh 4-6 pounds. The beef tenderloin is larger at one end than the other end, which tapers down. The best way to make it more uniform for even cooking is to cut a three to four inch piece off of the end that tapers down. Tie it over the same end. The large end also needs to be tied in order to open it up and properly remove all the silver skin. Beef tenderloin has very little fat… so that means little flavor. It’s very tender but you need to season it well. My favorite way to season beef tenderloin is with kosher salt and fresh ground black pepper. For added flavor, smear chilled bacon fat on it!! Sear on medium-high direct heat and then move to indirect medium heat for about 20-30 minutes, or until internal temperature reaches 130 to 135 degrees. Remove from heat and tent with foil for 20-30% of the cook time. This allows the redistribution and reabsorption of the natural juices. I suggest a ½ pound per person. Whole beef tenderloin will serve approximately 8-12 people. Prime rib is one of the nine primal cuts of the steer. There are thirteen ribs on the animal, five on the chuck (shoulder), seven on the rib, and one on the short loin. These seven ribs weigh about 18-22 pounds when trimmed, and are packed with tons of flavor! The prime rib has such a beautiful presentation for your Christmas dinner. It’s big, it has bones, and it has fat… all the things I love in a beef roast!! Some customers prefer the larger end, because it is leaner, while others, (myself included) like the smaller end that has more fat. It’s really a personal preference. Both are very tender and flavorful. We sell both kinds at my market. 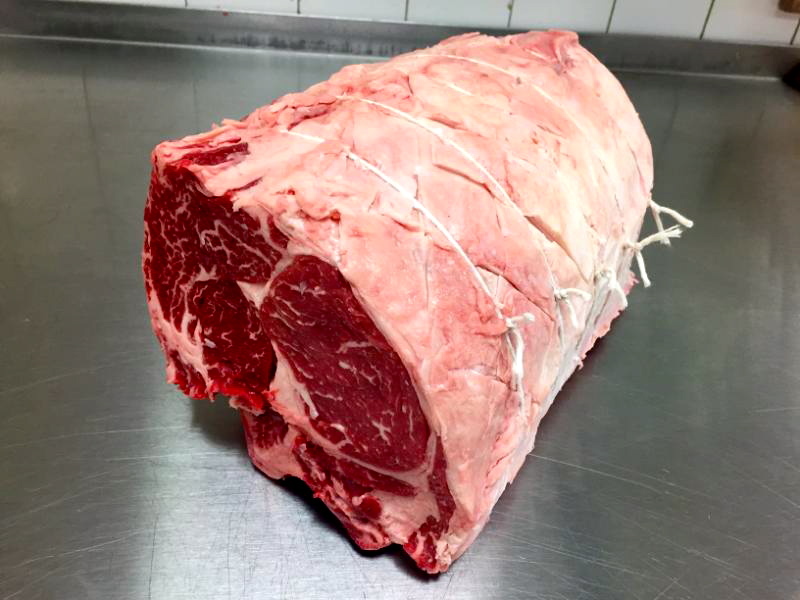 Some customers just don’t want to bother with the bones, yet want a wonderful roast. Many want the bone for more flavor. When we prepare a bone-in prime rib, we remove (shell) the rib bones in one piece and then tie the ribs back on. This makes it easy for carving. Simply cut the strings, lift the meat off the ribs, and carve. Use olive oil, kosher salt, fresh ground black pepper. I also like to cut a few slits in the roast and insert sliced garlic. 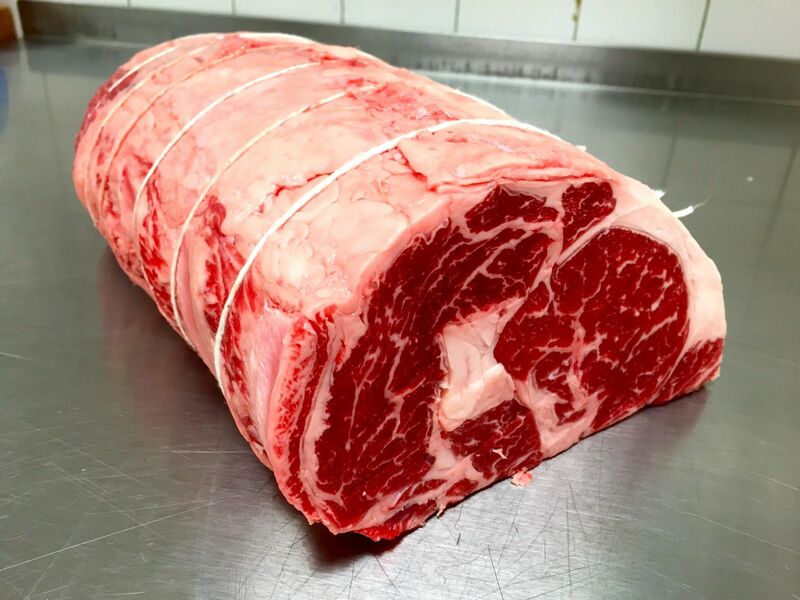 Prime rib roasts are usually large, three to four ribs are the average size that I sell. Roast on indirect medium heat for about twelve to fourteen minutes per pound. Remove from heat at 130 degrees for medium rare, and let rest. I always tell my customer to figure on 1 rib for 2 people with big appetites, or 3 people per rib if it is being a part of a large dinner with many other dishes.